Huge Savings Item! Free Shipping Included! Save 20% on the Britax 2017 B-Agile Stroller, Steel by Britax USA at Baby Stroller Car Seat Combo. MPN: U781922. Hurry! Limited time offer. Offer valid only while supplies last. The Britax 2017 B-Agile 3 is the best-selling, lightest and most easily maneuverable stroller so you have the freedom to get where you need to go. The Britax 2017 B-Agile 3 is the best-selling, lightest and most easily maneuverable stroller so you have the freedom to get where you need to go. The B-Agile 3 won't weigh you down thanks to its lightweight aluminum frame. Designed with multi-tasking parents in mind, the quick-fold design allows you to close the stroller in seconds with just one hand. 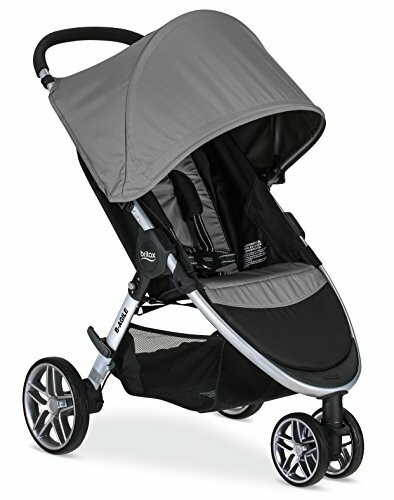 The 3-wheel configuration with swivel front wheels is one reason this stroller is a customer favorite. This feature provides an ultra-small turning radius so you easily glide through crowds, thin aisles and other tight spaces. Combine the maneuverable B-Agile 3 with any Britax infant car seat and you get the perfect travel system from the #1 brand in safety technology. The Click & Go System allows for a quick and secure connection - with a set of complimentary adapters packaged with the stroller. The B-Agile 3 is also compatible with other major infant car seat brands with the use of an adapter (sold separately). Large under-seat storage and additional zippered pocket fit all of life's essentials.